The proper blend of pumpkin spice ingredients can take the flavor of a pumpkin recipe from pretty good to terrific. Using the proper blend of spices, you can enhance the earthy flavors of the pumpkin with a warm spiciness that pleases the palate. You can buy pre-made blends or easily create your own pumpkin spice in just a few minutes. Pumpkin is the ultimate fall flavor. When properly spiced, it has both an earthiness and warmth to it that is quite simply delicious. Using the proper blend of pumpkin spice ingredients can enhance all of your pumpkin recipes - from pumpkin crème brûlée to pumpkin pies, breads and muffins. The key to good pumpkin spice is in the balance and quality of the ingredients. Typical ingredients in pumpkin spice include cinnamon, allspice, nutmeg and ginger. Cinnamon is the star of pumpkin spice. It has a warm spicy flavor that enhances the sweet earthiness of the pumpkin. High quality cinnamon comes from Sri Lanka (formerly Ceylon), and is often known as Ceylon cinnamon. The cinnamon that you typically find on the spice shelf at the grocery store is actually cassia and has a slightly different, complex, sweeter flavor profile than Ceylon cinnamon. Ceylon cinnamon can be found in gourmet stores, and is the preferable cinnamon for pumpkin spice. Use the highest quality cinnamon that you can afford. Ginger gives pumpkin spice a nice hit of warmth and spice. Ginger comes from the ginger root tuber. Use the dried ground form of ginger, making sure to use the best quality ginger you can afford. Nutmeg comes from the seed pod of the fruit of an evergreen tree from the Middle East. It has a warm, slightly woody flavor. As an interesting side note, nutmeg comes from the same plant as mace. Whenever possible, buy the whole nutmeg and grate it with a spice grater such as the Microplane zester/grater. If you can't find whole nutmeg or lack a way to grate it, go ahead and use ground nutmeg. Allspice is a warm, fragrant and complex spice that comes from the berries of the Pimenta dioica. You can purchase the allspice either ground or whole. If you purchase it whole and grind it yourself in a spice grinder or coffee grinder, it may be more strongly flavored than the pre-ground allspice. Try to use whole allspice if at all possible. If you can't find whole allspice and grind it, then ground allspice is an acceptable alternative. The recipe can easily be doubled, tripled or made in large batches and stored. While the flavor is best if you make your pumpkin spice as needed from freshly grated spices, you can make it ahead in large amounts and store it. To store the pumpkin spice, seal it in an airtight container and store in a dark, dry location. Pumpkin spice can replace all of the spices in any pumpkin recipe. 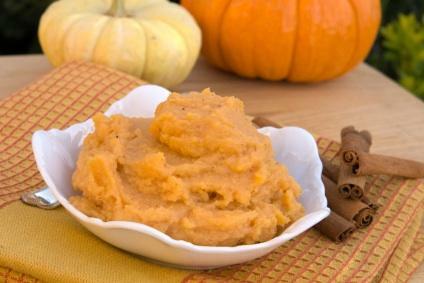 Typically, about one tablespoon of pumpkin spice works well in pies, muffins and breads. You can also use pumpkin spice to spice up squash or sweet potatoes. It can also be a seasoning mix for sweet potato pie.